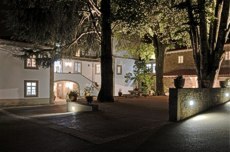 Accommodation at Quinta de Malta. 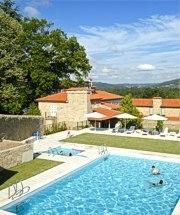 Quinta de Malta is a superb property with a wide range of facilities providing all that is required for a relaxing and utterly memorable holiday. 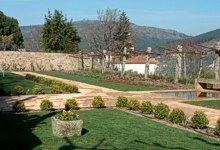 It is centrally located between Barcelos, Viana do Castelo and Ponte de Lima and is close to several places of interest. The original house dates back to the mid 16th century and has been completely restored following successive improvements over the years. 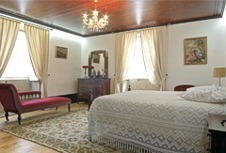 The property is surrounded by fields of vineyards, producing the excellent wine of the Quinta. The accommodation at the main house comprises 4 ensuite bedrooms, 2 doubles and 2 twins. Each pair of bedrooms (1 double and 1 twin) has access to a private living room with Cable TV and telephone. All bedrooms have internet access. Attached to the main house, is a 3 bedroom apartment with 2 double rooms and 1 twin. Each bedroom has an ensuite shower room. Room facilities include satellite television, minibar and hairdryer. The apartment also has a kitchenette with 2 hobs, fridge and a microwave. In front of this apartment, there is a large patio area which all guests have access to. On the other side of the patio is a smaller apartment with 1 double bedroom with ensuite shower room, a sofa and a fridge. Facing the pool, there is a two storey apartment with 2 bedrooms, both with private bathroom and a TV. The bedrooms are located on the first floor and one has a door opening to steps down to the ground floor. The lounge and kitchenette are on the ground floor. The lounge has a TV, sofas and a fireplace while the kitchenette has 2 hobs, a fridge and a microwave. All bedrooms at this beautiful property are air-conditioned and each bedroom is named after a flower, adding the personal touch. The owners are continually striving to improve the property in order to provide both maximum comfort as well as leisure activities for their guests. The Varandao room, located above the 3 bedroom apartment, has a lounge area with a TV, 2 sofas, a games table and a fireplace. There is also a games room with a football table, a snooker table and a projector with flat screen. This room can also be used for small meetings. Both rooms are available to all guests. Additionally, there is an independent communal living room where breakfasts are served, which has a TV, a DVD player and a tennis table. The house is surrounded by a large well kept lawned garden. It also features a fountain which was originally the swimming pool. There is also a tennis court close by. There are 2 swimming pools, one for adults and one for children, which are located on an elevated, secluded area of the garden. There is a pool side shower, as well as an annex with 2 more showers, sauna and a small gymnasium. The property has a private car park and garage. Barcelos is a small Roman town and every Thursday it hosts the most famous market in Portugal. The town also has many small, excellent restaurants offering wholesome and inexpensive Minho cuisine. The delightful old sailing town of Viana do Castelo is about 18 kilometres away and the nearest Atlantic beaches are about 15 kilometres away. For golfing parties, there are excellent courses at Ponte de Lima, Quinta da Barca and Estela, all within easy reach by car. 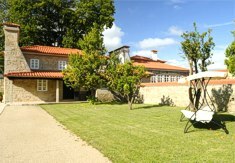 Quinta de Malta is approximately a one hour drive from Oporto airport.